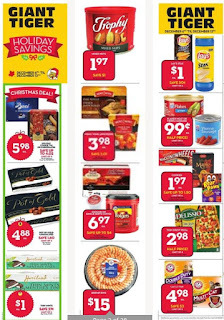 Giant Tiger Flyer Canada - December 6 - 12, 2017,Holiday Cookie Tin Or Chocolates Model : 812758 817006 $9.99-$10.00 Regular Price $5.98 Sale Price Up to $4.02 Savings Assort. 343 g or 1 kg. Limit of 4. Pot Of Gold Chocolates Model : 812659 $6.48 Regular Price $4.88 Sale Price $1.60 Savings Assort. 247 g. Limit of 4. Haviland Thin Mints Model : 772108 $1.27 Regular Price $1.00 Sale Price $0.27 Savings Limit of 6. 85 g. Trophy Mixed Nuts Model : 812020 $2.97 Regular Price $1.97 Sale Price $1.00 Savings 225 g. Ground Or Single Serve Coffee Model : 486230 671257 $7.97-$10.57 Regular Price $6.97 Sale Price Up to $4.00 Savings Assort. 642-920 g or 12 pack . Shrimp Ring Model : 813235 $15.00 Sale Price 650 g.Lay's Stax Model : 647112 647115 $1.50 Regular Price $1.00 Sale Price $0.50 Savings Assort.155-163 g.
Limit of 6. Flaked Meat Or Vienna Sausage Model : 588665 206103 $2.00-$2.34 Regular Price $0.99 Sale Price 50% Savings Limit of 6. Assort 115 g.
Limit of 6.Dare, Bear Paws Cookies Model : 719960 777267 594240 $2.77-$3.47 Regular Price $1.97 Sale Price Up to $1.50 Savings Selected varieties. Limit of 6. 168-360 g. Arm & Hammer Cat Litter Model : 516130 580659 $7.96 Regular Price $4.98 Sale Price $3.00 Savings 6.4 kg. Limit of 3. Assort. Black Diamond Cheese Bars Or Slices Model : 777801 698754 698748 $5.99-$6.97 Regular Price $3.77 Sale Price Up to $3.20 . Savings Assort 260-430 g. Limit of 4.Country Kitchen Smoked Ham Model : 661132 $6.97 Regular Price $5.97 Sale Price $3.00 Savings Limit 3. 800 g.
Clementines Or Ruby Red Grapefruit Giant Tiger Weekly flyer Or Kiwi Model : 495344 450757 398672 731085 724166 687001 686995 731088 542955 484658 484659 735655 $2.47 Sale Price Clementines 2 lb. 3 lb ruby red grapfruit product of UDS or Mexico. 500 g kiwi. 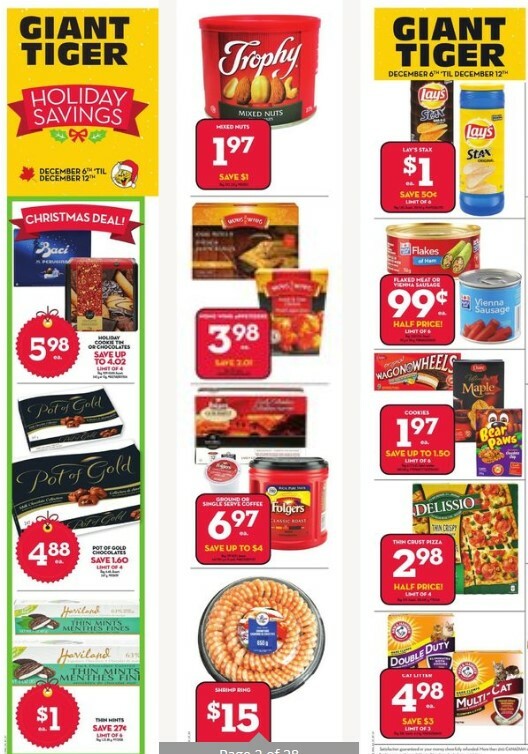 500 g. Campbell's Broth Model : 306947 $1.97 Regular Price $1.77 Sale Price $0.20 Savings Asst. 900 ml.